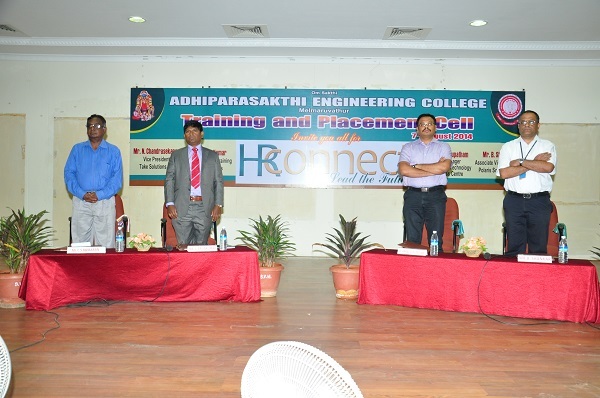 ‘HR Connect’, A event organized by Training & Placement Cell of Adhiparasakthi Engineering College. HR managers from leading companies participated and addressed their thoughts to our students. Our Guests for the function…. Dr. Anand Gurupatham, Senior Manager, Renault Nissan Technology and Business Centre. Mr. J. Arun Kumar, Senior Manager – Training, Ramco Systems Mr. C.S. Kumaran, Head – Finance, Mobius Knowledge Services Mr. B. Shankar, Associate Vice President, Polaris Software Ltd.